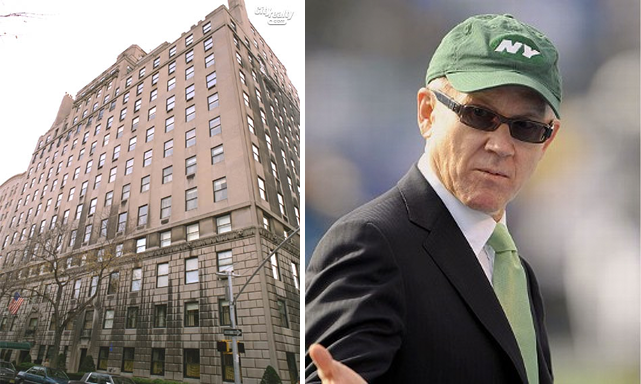 In addition to holding the record for highest purchase of a sports team in New York (he bought the Jets in 2000 for a whopping $635 million), Johnson & Johnson heir Woody Johnson now also holds the title for most expensive co-op ever sold in the city. His 11th/12th floor duplex at 834 Fifth Avenue has been snatched up by billionaire Leonard Blavatnik for $80 million, well over the $75 million asking price. This far surpasses the previous co-op sale record, set when Israel “Izzy” Englander bought a duplex at 740 Park Avenue for $71.3 million. This is merely pocket change for Blavatnik, though, as he’s the 32nd richest man in the world and worth an estimated $21.8 billion. It’s not known if he’ll take up residence in his latest acquisition or just add it to his trophy case of high-end real estate. He also paid $31.25 million for 2 East 63rd Street, the city’s widest mansion; $27 million for a unit at 998 Fifth Avenue; and $51 million for Edgar Bronfman’s townhouse at 15 East 64th Street. Johnson didn’t live in the home; he used it solely for fundraisers and parties. It has five bedrooms, 5½ bathrooms, and three maids’ rooms, as well as a large staircase and open layout perfect for entertaining.